Inspired pieces create inspired spaces. 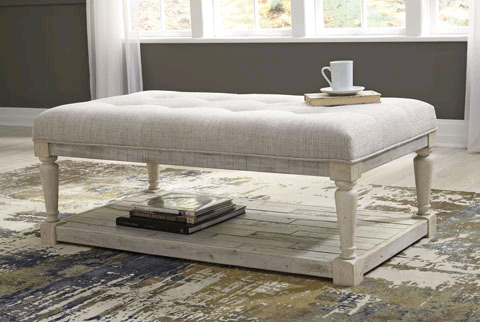 The Shawnalore ottoman cocktail table charms your home with farmhouse style. White textural finish highlights the weatherworn feel of the wood tones and purposeful nail holes. Thick tufted cushion top with linen look cover is pleasingly soft. Stow away fashionable books on the planked bottom shelf. Made with pine solids and veneers with textured surfaces. Finished in a white textural color that highlights the reclaimed feel of the wood tones and nail holes. Drawers are fully finished with dovetail construction and ball bearing guides. Wrought looking bar pull hardware in an industrial silverbronze color finish. Cocktail table has a thick tufted cushion top in a linen look cover.